WARNING: Before you read, we must warn you that this blog contains MASSIVE spoilers. If you wish to be spoiler free, then do not delve any further. You should turn back now. You wish to continue despite what awaits? Very well. Do you have the fire of wanderlust within you? Will you follow in the footsteps of those who came before and explore the unknown? The Age of Exploration has come and gone. Our satellites have mapped even the most remote land masses. Yet, the hidden places of the Earth are still awaiting discovery. Despite all our technology, we have yet to fully explore the ocean depths. Only a select handful of us have set foot inside the deepest cave systems, and that’s only the ones we know of. Which brings us to the mysterious Abyss: An unfathomable, gaping maw that continuously leads downwards into the unknown secrets of the world. Two brave explorers will now follow the footsteps of all those who came before. But their quest will not be without scars. MADE IN ABYSS is as haunting as it is beautiful and is filled with many emotional moments. Today, we will discuss five of them. Determined to find her mother, Riko vows to travel all the way to the bottom of the netherworld, where she waits. Reg will help guide the way. But first, they must say goodbye to the friends they will never see again. Where Riko and Reg are going, their friends cannot follow. If they were only traveling down to the first or second layers of the Abyss, then that would be a real possibility. 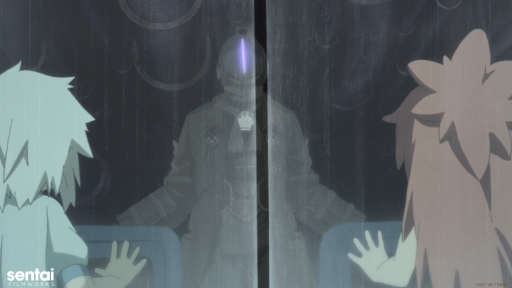 But Riko and Reg’s expedition will take them down into the unknown depths, from which no one has ever returned. They will not be able to see their friends the next day or the day after that. This is Riko and Reg’s final goodbye to everyone they once knew. They all know this and, despite their earlier pleas, Riko will not turn back. And yet, bittersweet hope remains. “Even if we never get to see each other again, we’ll be connected by the Abyss.” Those are some of the last, tearful words Riko tells Nat before their fateful parting. A promise that, despite cruel reality, they will always share a connection. ...and are swallowed up by the Abyss. It’s not the fall that kills you inside the Abyss. The chasm demands a price from anyone foolish enough to explore its depths. A toll that it forcibly collects upon ascent, making any escape attempt increasingly difficult the further down you are. This is made crystal clear when Riko succumbs to the curse in the fourth layer, The Goblets of Giants. With Riko poisoned by one of the countless predators roaming the Abyss, Reg forces an emergency ascent to escape it. Yet, the Abyss is apathetic to Riko’s situation; It does not care what her circumstances were. 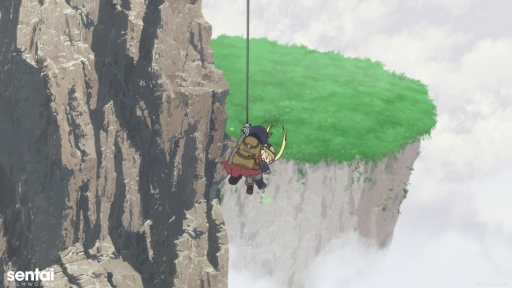 It’s a stark reminder that, despite its visuals, MADE IN ABYSS is not a whimsical adventure to the Earth’s center. The Abyss is as eldritch as it is dangerous, and no sane person should ever explore it unprepared. There’s a reason why humans implemented the whistle system. But this isn’t the worst that Riko and Reg will ever face. Their friends on the surface did not give their warnings lightly. At this point in the story, Riko and Reg are approaching the point of no return. Go down far enough, and you can never return to the surface. Go down far enough… and the curse will demand death from those who wish to see the sun again. 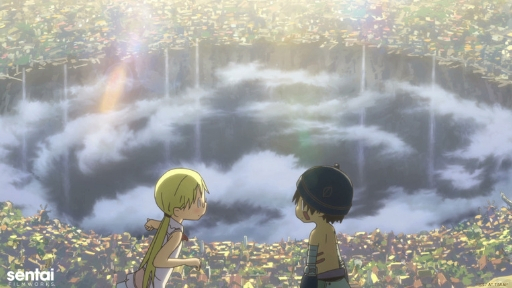 Fortunately for Riko and Reg, not everything that lives in the Abyss is hostile. Who do they meet? None other than Nanachi, who offers the two refuge on their journey as Riko recovers from her near-death experience. To understand why this scene brought shouts of joy from the fandom is two-fold. 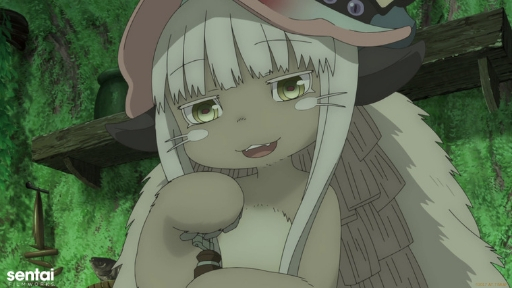 First, Nanachi is an extremely popular character and a fan-favorite. Readers of the manga were anticipating this character's appearance. Second, Nanachi appears at the moment when Riko and Reg need help the most. Riko not only suffers from the effects of the curse but is maimed as the result of a botched amputation attempt. Don’t be too harsh on Reg. Desperate times call for desperate measures. If it weren’t for Nanachi, there was a genuine chance that Riko’s journey would have ended in the fourth layer. Her death yet another statistic. Her life claimed like so many others by the gaping maw of the Abyss. Nanachi and Mitty’s friendship has survived much, even the White Whistle, Bondrewd. The two used to be human orphans with no place to go; No one to miss them when they were gone. But like what happened to Riko in the Goblets of Giants, the Abyss is indifferent to who it curses. Nor does it allow extenuating circumstances for innocent children used as human guinea pigs to further the cause of science. What, do you ask, is the curse of ascending from the sixth layer of the Abyss? The two friends mutate before each other's eyes. But Nanachi was the lucky one. Nanachi was the one to at least keep a rational mind and a humanoid body. But Mitty? She dissolves into a gelatinous and pitiful creature. One that is immortal and in constant pain. Her last coherent words as she melts? Begging her friend to kill her and end her misery. Nanachi never forgot Mitty’s last words and had been searching for a way to end her pain for a long time. Unfortunately, Mitty is immortal and regenerates from every injury. Mitty is missing an eye, which was an injury caused by a relic in Bondrewd’s possession. One that was eerily like Reg’s Incinerator. 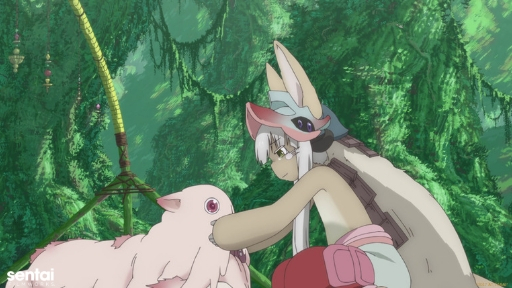 Realizing that Mitty could finally know peace, Nanachi begs Reg to put Mitty on the pathway to the end of her misery. Just try to watch the scene without crying. We didn’t make it. We didn’t make it at all. 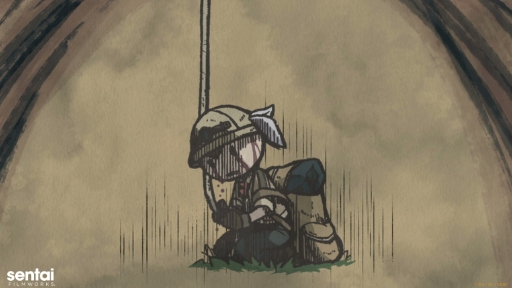 MADE IN ABYSS can be hard to watch at times, but we couldn’t do it justice if we sugar coated things. The greatest stories are the ones that invoke an emotional response from the audience. And, boy, does it hit you right in the feels. The series balances its themes on a razor’s edge. On one hand, its filled with an almost childlike wonder of exploring the unknown. Yet, on the other, it depicts the harsh reality of death lurking out of the corner of your eye. Knowing about the dangers often does not prepare one from experiencing it firsthand. Prepare yourselves: The dub for MADE IN ABYSS premieres TODAY on HIDIVE! Better yet, be sure to preorder the premium box set from the Sentai Shop! Be sure to subscribe to our newsletter and let us know about your favorite moments by tagging us with @SentaiFilmworks with the social media buttons below. If you stare long enough into the Abyss, the Abyss stares back.